Music, theatre, fine arts and history make up Cayuga County’s rich culture and lifestyle. Take an hour or spend the day exploring the City of Auburn, known as “History’s Hometown.” Its amazing historic treasure, Harriet Tubman National Historical Park will draw you into the life of this famous conductor on the Underground Railroad. Known as the “Moses of her people,” her story will engage your emotions. Or step back in time at The Seward House Museum, home of William H. Seward, who was the leading figure in the purchase of Alaska, then known as “Seward’s Folly.” The Finger Lakes Musical Theater Festival will entertain musical theater enthusiasts by bringing ‘Broadway’ to the Finger Lakes all summer long. Cayuga County is home to some of the Finger Lakes’ most charming and beautiful towns and villages. From the resort community of Fair Haven on the Great Lakes Seaway Trail, a National Scenic Byway, to the historic village of Aurora on the Cayuga Lake Scenic Byway – you will be surprised and delighted by small town life. The Route 90, 50-Mile Garage Sale is just one of the unique events that happen along the Cayuga Lake Scenic Byway each summer. A ‘must-visit’ in Aurora is the world renown MacKenzie-Childs, maker of imaginative, whimsical hand-decorated tableware and home furnishings. You will surely feel like you have just stepped into Alice’s wonderland. Small farms and vineyards are a sight to behold here too. These gems preserve the landscape and they provide great tasting food and drink! “Foodies” will find Cayuga County’s seasonal bounty as rich as its soil, and its award-winning Finger Lakes wines and craft beverages are second to none. 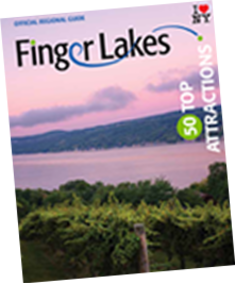 The Finger Lakes Sweet Treat Trail, a trail of locally grown and produced items such as honey, jams, syrups and fruits, is not to be missed. This unique trail was named one of the 10 Best Food Trails by USA Today. For adventurous types, an abundance of outdoor recreational activities are available for you to conquer, including hiking, biking, fishing and paddling! With three state parks, well-groomed trails, nature preserves and three state forests, the opportunities are plentiful to get out and enjoy the great outdoors. Grab all the gear you need for your outdoor adventure at Bass Pro Shops, the leading national retailer of outdoor gear, located in the Fingerlakes Mall, Auburn.